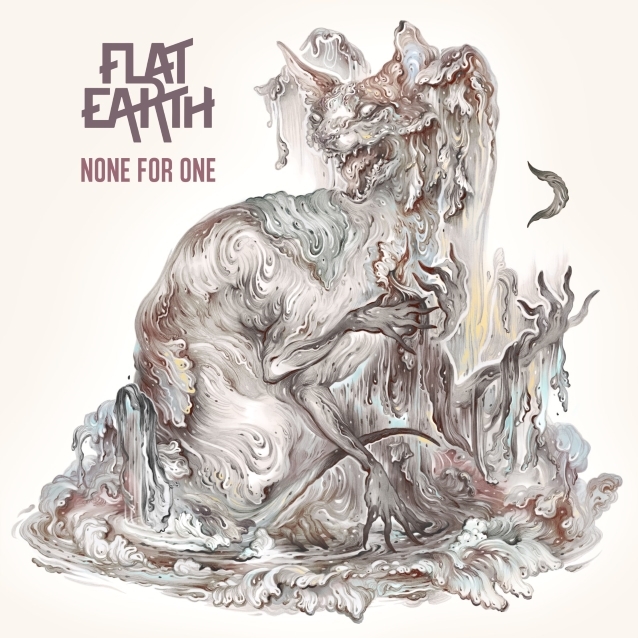 FLAT EARTH, the new band featuring former HIM members Mikko "Linde" Lindström (guitar) and Mika "Gas Lipstick" Karppinen (drums) alongside ex-AMORPHIS bassist Niclas Etelävuori and POLANSKI singer Anttoni "Anthony" Pikkarainen, will release its debut album, "None For One", on November 9 via Drakkar Entertainment in Europe excluding Finland (where the effort will be made available through the band's own label Suur Etikett). 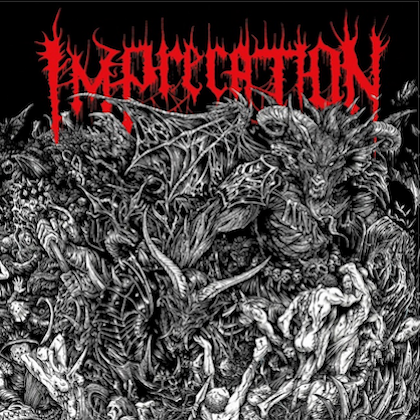 The disc was recorded at Finnvox in Helsinki with producer Hiili Hiilesmaa, who has previously worked with HIM, AMORPHIS, THE 69 EYES and APOCALYPTICA, among others. The official lyric video for the song "Cyanide" can be seen below. Pikkarainen explains what the song is about: "I have a strong tendency of creating a picture of a person with a lot of issues in my head who I then try to encourage to change in my lyrics. I'm very likely just processing my own shortcomings in this manner, and I really don't like telling anyone what to do, but this is what I've noticed about my writings. So in this song, I intentionally placed myself out there as well. I tried to be very honest about the way I see the world, to take off some of the weight of doing so much preaching. I thought cyanide is a bit too much for a song title, but it does sum up my ideas quite perfectly." According to a press release, "None For One" contains eleven tracks that "deliver a magnetically melodic sound and are thoroughly permeated by vocalist Anthony's passionately melancholic overtones. FLAT EARTH delivers in the same parcel both the beauty and the beast." The cover artwork for "None For One" was created by Minna Niskanen and can be seen below. 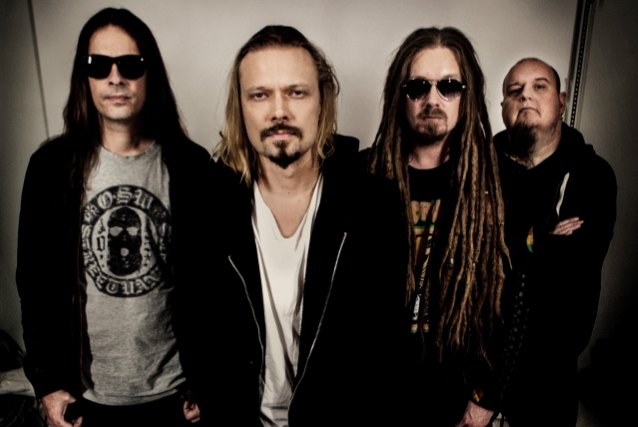 FLAT EARTH's "Blame" video was mainly shot during the recordings of the disc in February and March by Tommi Mattila, who followed the band to capture some documentary material. Niclas explains: "After over two decades playing with bands, I was at a point thinking that maybe I start doing something else. But then I knew I had these songs on my hard drive still, and nothing was done with them. And I just wanted to get rid of them and see what happens. But then it kind of took over and I started to focus more on that." Linde first sprang to mind, even though he still had his hands full with HIM at that time. Nevertheless, the two of them kept meeting regularly, and started working on ideas for new songs. Getting Anthony on board provided additional inspiration. And when their old bandmate Karppinen finally joined on drums, the group's lineup was completed. While Linde was busy playing the States and Europe on HIM's farewell tour, the remaining trio spent their time recording drums to seven pilot demos that had previously been taped in Niclas's basement studio. Gas brought along two of his own songs, and Anthony composed a new track for the band. Linde found an old song of his he had first fleshed out when he was only 13. The rest of the tracks were Niclas's ideas mainly, treated to the band's arrangements, with Anthony providing both the vocal melodies, as well as the lyrics. The basic structure for the first album was ready. Linde remembers: "Our common friend, who's been helping us get this band off the ground, recommended a guy named Anttoni 'Anthony' Pikkarainen, who had been singing in a band named POLANSKI. The band had made a record, and after we'd listened to it, we had to set up a meeting immediately. "I have a great feeling about our new band. Anthony had recorded with Hiili Hiilesmaa before, and the rest of us have known each other for years. It feels as if all the stars have finally aligned."